We’ve been testing water cooling solutions for today’s hotter-running, higher OCing CPUs, and today we have the Corsair H110i GTX from Corsair’s “Hydro” series. 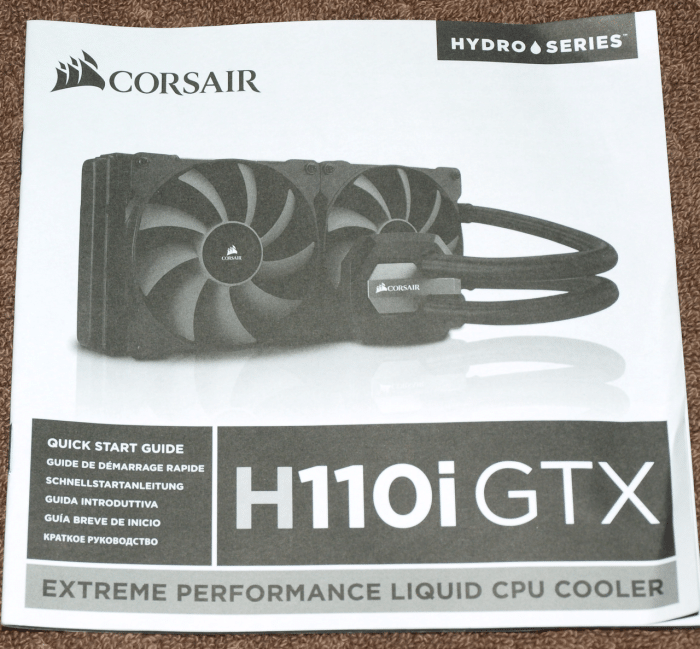 The Corsair H110i GTX is one of the most critically acclaimed coolers in the AIO (All In One) arena. 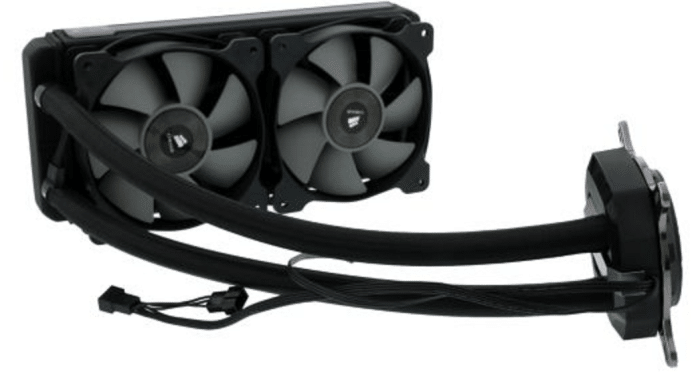 With a factory sealed loop and ready-to-go, out-of-the-box configuration, it’s a simple matter of attaching the fans, mounting to the chassis and slapping the block/pump combination on your CPU and you’re water cooling. What’s the advantage of water cooling you ask? Well, water carries 10 times the capacity to remove heat that air does, so it’s more efficient and can cool better than air ever thought about. Shown here assembled, the Corsair H110i GTX is the top of the line unit in the Hydro series, and boasts extreme cooling for extreme OCing. 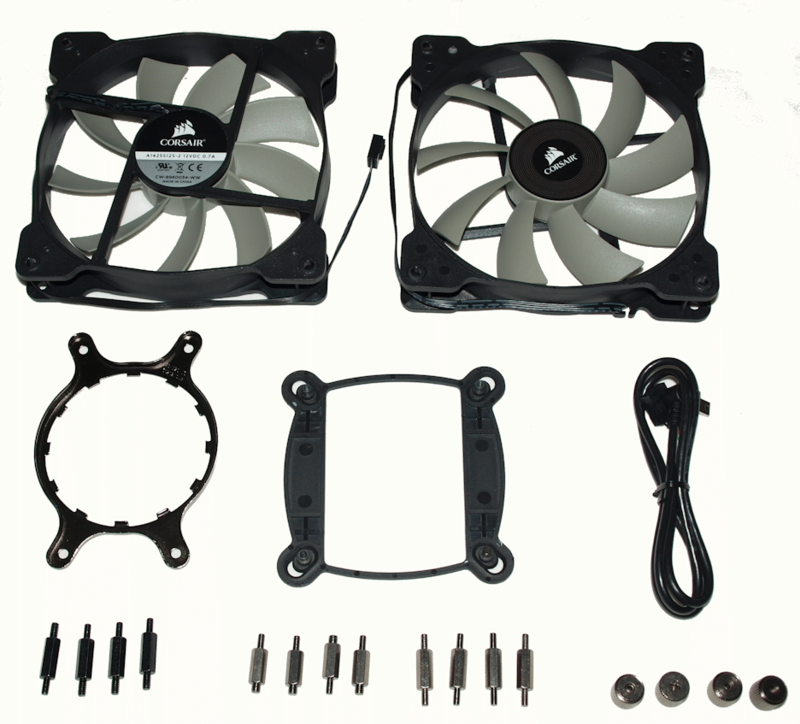 The 280mm radiator comes with two Corsair SP140L PWM fans and while we like four fans on our dual radiators, two is a good start, as you can always add a couple of fans later. 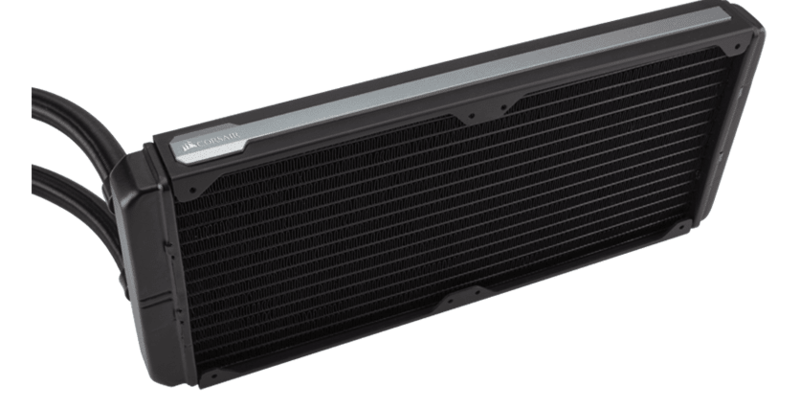 Like many AIO water coolers, the Corsair H110i GTX features a lightweight aluminum radiator measuring 140mm x 312mm x 26mm. 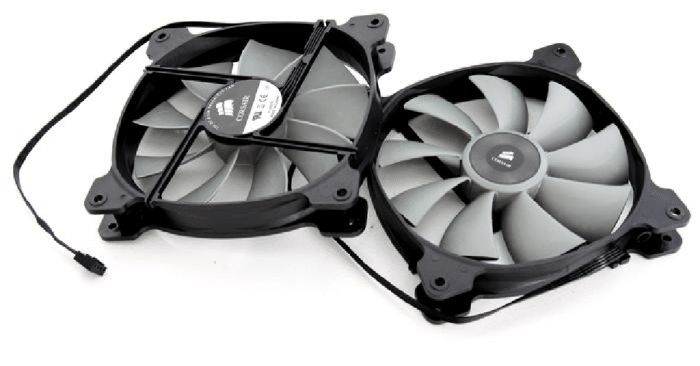 You can easily fit two fans on each side if you like, and since it’s an All-In-One, it comes filled with coolant and is ready to hook up. 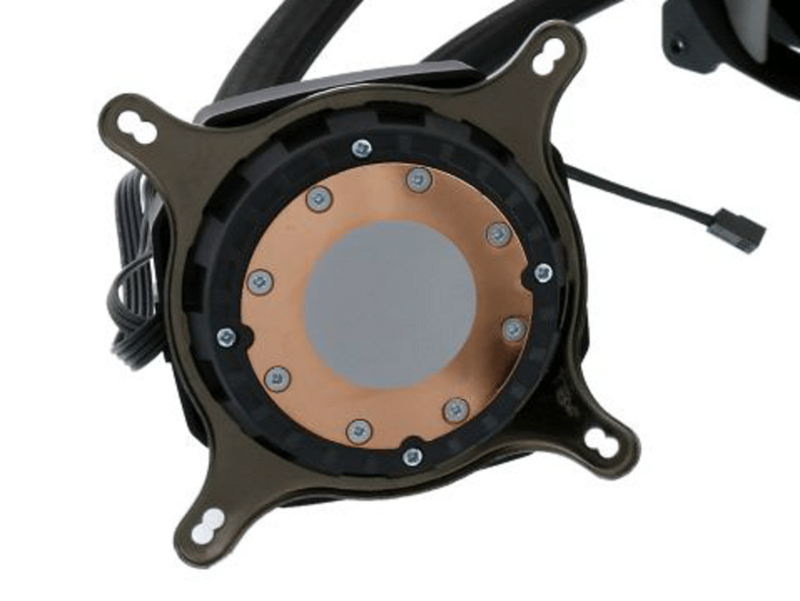 Corsair thoughtfully covers the CPU waterblock with thermal Interface material in case you forgot your Arctic Silver. Most of the pre-applied thermal materials will work well enough, but we prefer to carefully remove it and go with our traditional Arctic Céramique 2. Arctic Céramique 2 usually provides a thinner layer of TIM and better thermal qualities than the paste that many manufacturers pre-apply. 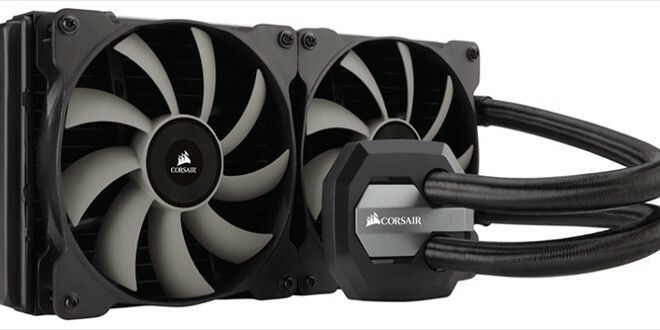 Of all the AIO units we’ve tested, the Corsair has the most pleasing aesthetic value, and while we give the looks of a product a little consideration in scoring, it’s really the performance we look for. A good-looking videocard or AIO water cooling unit helps give a better impression, but it’s still a black radiator with a couple of black fans. On the upside, this unit has been taught a few new tricks like the USB connector that lets you monitor your CPU via the built-in Corsair Link. 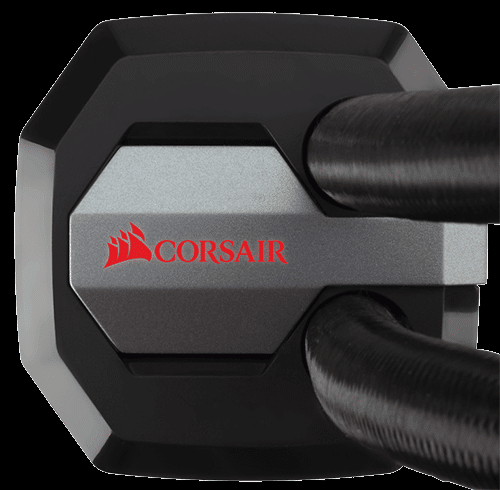 Once you connect the Corsair Link USB cable, just go on and download Corsair Link and you can monitor coolant and CPU temperatures as well as customize cooling performance. With Corsair Link you can even color coordinate the CPU block/pump lighting to match your system’s color, or set the colors as an indicator of CPU temperature. This is a feature an enthusiast can appreciate and will get the H110i GTX a few extra scoring points. With the 140mm radiator you will find two SP140L high-torque PWM fans capable of running at 2000 RPM and an amazing 104.65 CFM with a static pressure of 3.99mm-H2O. Corsair says to expect 40dBA from these air moving monsters, and we fully expect 40dBA from them moving 104.65 CFM. We’ll be surprised if we don’t get more than 40dBA at 2000 RPM at that pressure. Then of course Corsair tossed in the pre-requisite Manual. So it is a review of the H110I GTX, yet you still post multiple images clearly showing the 120 mm version h100i GTX. And you even refer to the h100i in the socket compatability list. This is such a confusing review with several errors, that makes it difficult, for me at least, to take your results with any credibility. I have an ivy bridge 3570k clocked to 4.7 ghz with cool laboratory liquid TIM and arctic 13 cooler, and I don’t get more than 73C at load. I don’t see how this expensive water cooler is any better than my 30 dollar cooking setup? The Corsair H110I GTX offers an easy to install effective AIO water cooling solution.